OUR INSPIRATION - Pseudo Science Museum --- "Get ready to believe just about anything." Contrary to what you might believe, the museum is named after that great Roman thinker and philosopher , Pseudo Erroneous. He taught the Greeks ---Socrates, Plato and Aristotle, everything they knew. His work in early scientific principles so impressed his fellow scientists that they decided to name a new branch of science after him and thus was born Pseudo Science. This is even more impressive when you realize that science hadn't even been invented yet. Erroneous' "Chicken/Egg Theory" and his "Egg/Chicken Theory" were the first of their kind. As a matter of fact, they are still hotly debated today and the question remains --- which came first? Raphael's SCHOOL OF ATHENS before it was altered. There have been some questions as to whether Pseudo Erroneous actually existed. Historical documents are difficult to come by from this time period. Because of his ground breaking ideas it is believed that many of his journels have been destroyed over time or others have claimed his work as their own. Most attempts to erase him from history have been successful. However, a few clues to his existence still survive to this day. 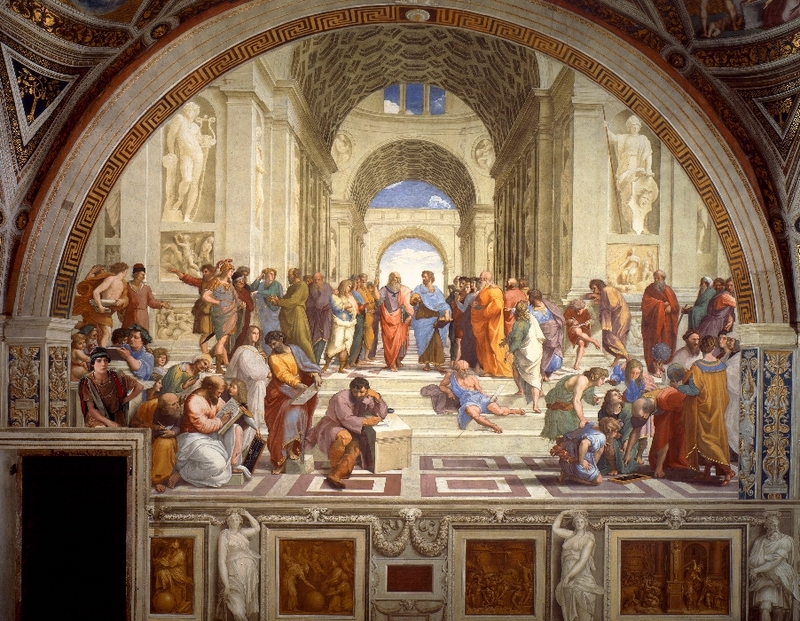 The above picture of Raphael's School of Athens is the only know photo of the famous painting before it was modified and the image of Pseudo Erronious was painted over. Why he was removed and by whom is not known. It can only be speculated that because he was an exchange student from Rome at the time that some believe he should not be included with all the great Greek minds of the day. Or perhaps his ideas are still considered too radical even today. However, Raphael believed he was important enough to include him in his master work. Some believe that perhaps the Vatican had him removed because of his scientific beliefs. Nevertheless, even though Plato and Aristotle dominate the picture as the cental figures, we cannot deny that Pseudo Erroneous was there and apparently played an important role in the history of science and philosophy.